Do you want to learn how to enhance your business through social media? The Stephenville Chamber of Commerce and America’s SBDC invite you to join us for a seminar presented by technology expert Eric Spellmann. Eric Spellmann is the President of Spellmann & Associates. 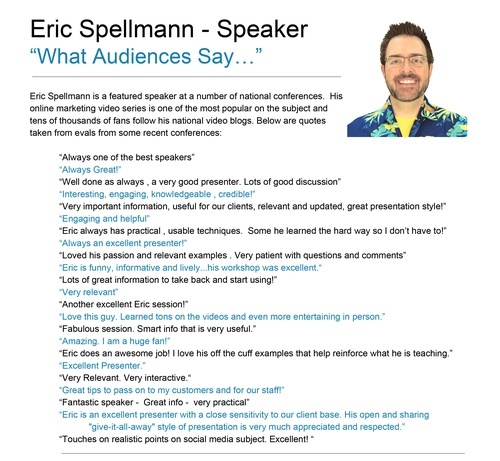 Eric has established himself as a leader in helping customers meet their online goals through practical, hands-on-application. In addition, he is a featured speaker at a number of national technology conferences. His unique style appeals to all levels of audiences. He is often hired to convey technically challenging topics to non-technical people and has been labeled a "Technology Evangelist." His online marketing video series is one of the most popular on the subject and tens of thousands of fans follow his national video blogs. These videos educate business owners all around the world on the latest Internet success marketing tools and strategies.